I am a typical shower kinda person, I totally not into long drawn baths. So when I stumbled upon the Hansgrohe Raindance Rainfall showerhead I was rejoicing at the prospects of installing this beauty. 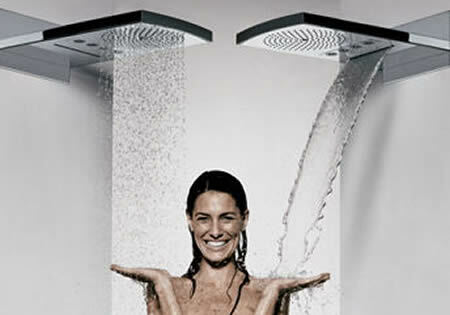 The most exciting thing about this showerhead is that you can either enjoy the water in its most natural forms: as a soft rain shower enriched with air, a massaging downpour or a clear and powerful waterfall. It’s the first horizontal, multifunctional shower panel in the world. “Architecturally integrated into the room design, with easy wall-mounted shower control”, that’s what the folks at Hansgrohe have to say about the Raindance Rainfall shower. Try as I did I could not figure out the pricing of this shower, maybe I’ll give it a skip while you skim their site for more details.